Today’s post is all about some of my best memories in life, and some of them are attached to this dish. Grandmama made this for us every year around Christmas time. It’s great for football season, of course, but we often had it on Christmas Eve because that is when my family eats Tex-Mex. By then we are turkey’d out and ready for something different so a full spread of our finest Tex-Mex dishes hit the spot! I tentatively dipped a corn chip in, a little nervous by the hopeful eyes of my grandparents watching me, took a bite, and declared it delicious with great relief to myself and to them! And so this dish, to me, will always bring with it memories of my Grandmama. What a wonderful person to remember. 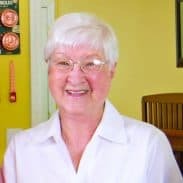 She was good hearted as the day is long, worked harder than anyone I’ve ever known, and always had a smile on her face. Most importantly, though, she looked for the good in every situation and it just wasn’t possible to be around her without a little of that rubbing off on you, too. My Grandmama made me a better person just for having known her. I can’t think of a much better legacy than that and I hope to live the kind of life that perhaps, some day, someone will be able to say the same of me. 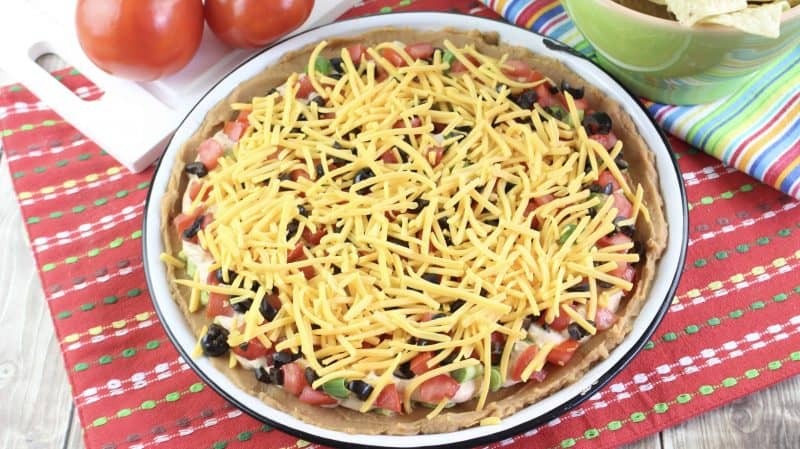 You’ll need: Avocados, lemon juice, salt and pepper, sour cream, mayo, taco seasoning, can of bean dip, green onions, tomatoes, black olives, sharp cheddar cheese, and some chips to eat this wonderful creation with. Peel, pit, and mash the avocados in a medium bowl. Add the lemon juice, salt, and pepper. Stir to combine a bit. Note: This is the only use in my life for avocados. Outside of this dip I can’t stand the things but in this dip, they are magical. 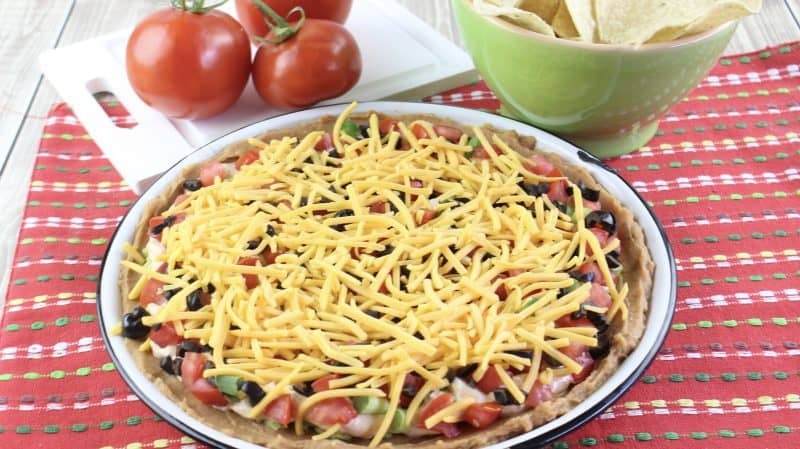 Spread bean dip on a large, shallow platter. Top with avocado mixture then sour cream mixture. Sprinkle with chopped green onions, then the tomatoes and olives. Cover with shredded cheese. Refrigerate until ready to serve. Serve with tortilla or corn chips. I’m getting excited for you because THIS IS SO GOOD! Peel, pit, and mash the avocados in a medium bowl. Add the lemon juice, salt, and pepper. Stir to combine. 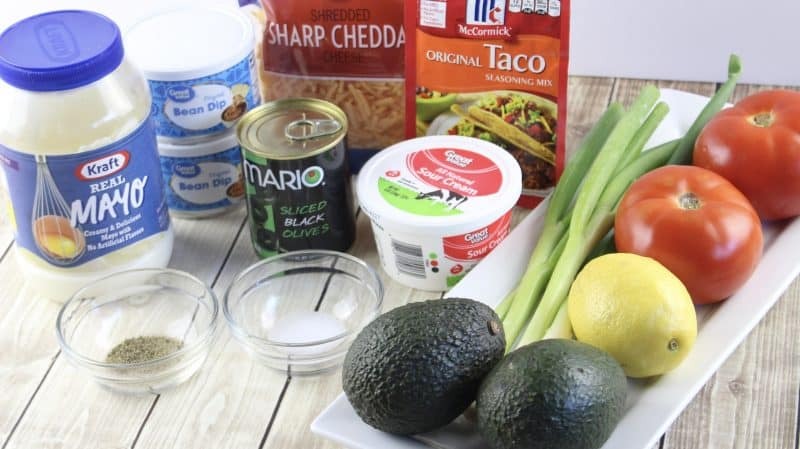 In a small bowl, combine the sour cream, mayonnaise, and taco seasoning, mix well. 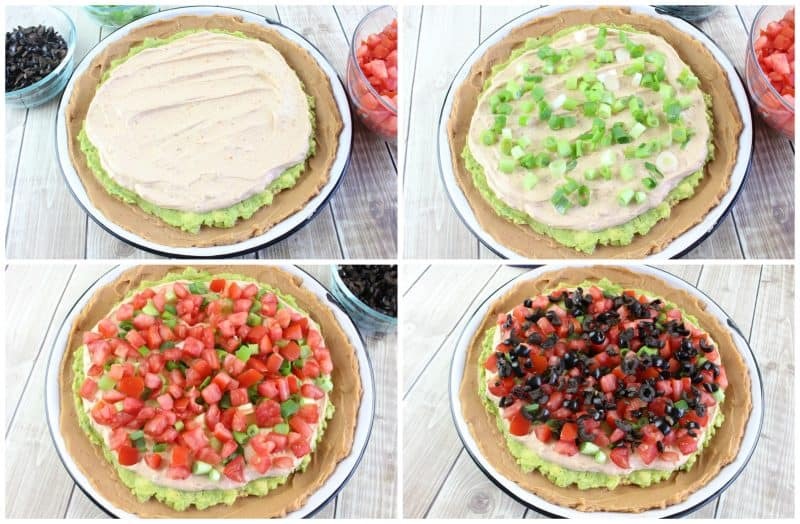 Spread bean dip on a large, shallow platter, Top with avocado mixture then sour cream mixture. Sprinkle with chopped green onions, then the tomatoes and olives. Cover with shredded cheese. Refrigerate until ready to serve. Serve with tortilla chips. I remember your Grandmama being such a sweet lady. I know you miss her. Very similar to my version. But, I leave out the avocado. I don’t even like it here! I love avocado! Give me more recipes with it. Yummy! 🙂 I hope you get to try this one soon Melinda!! That is one of the great things about this recipe, it can be made to suit most everyone’s taste!! AAAWWW… I love seeing your sweet Grandmama’s smiling face. This dip could be a meal in itself. Cant wait to fix me some and share it with Ed.. It really could be a meal Barbara!!! I hope y’all enjoy it! YUP! Just like we enjoy it minus the avocado…but we do love avocado so may have to add it next time around. Thanks for sharing! I hope you get the chance to try it with avocado soon, I think you will love it!! I have made this many times and everyone liked it. Your Grandmother was and is still special to you. I hope mine feel that way about me. I am positive they do Bonnie!!! I make something quite similar, but I use Bush’s Cocina Latina refried black beans (preferred) or their regular refried beans instead of the bean dip. 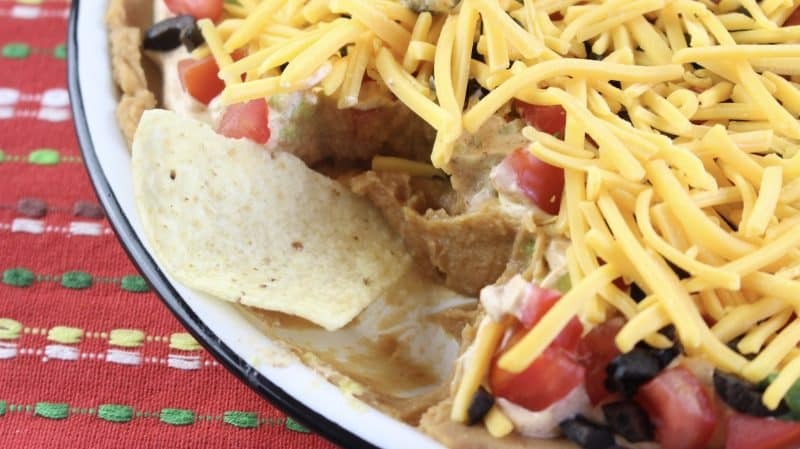 I used to use the bean dip too until Bush’s started making refried beans, so much more flavor and adds a little texture. 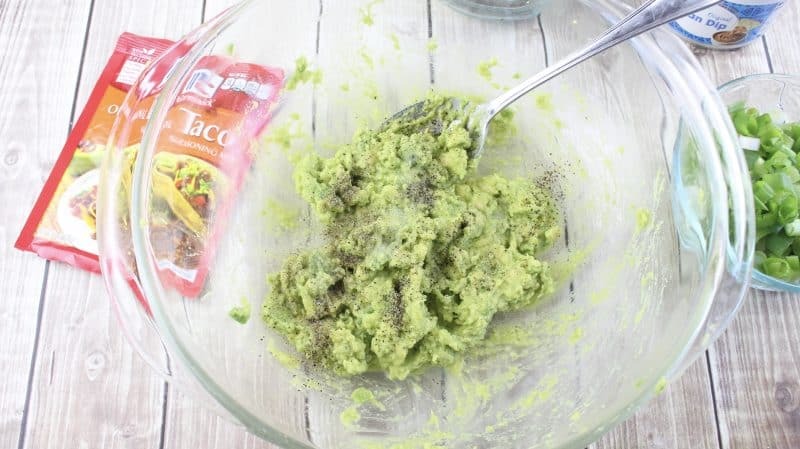 I add a sprinkle of chipotle pepper to the avocado mix for a little smoky heat and use lime juice instead of lemon. 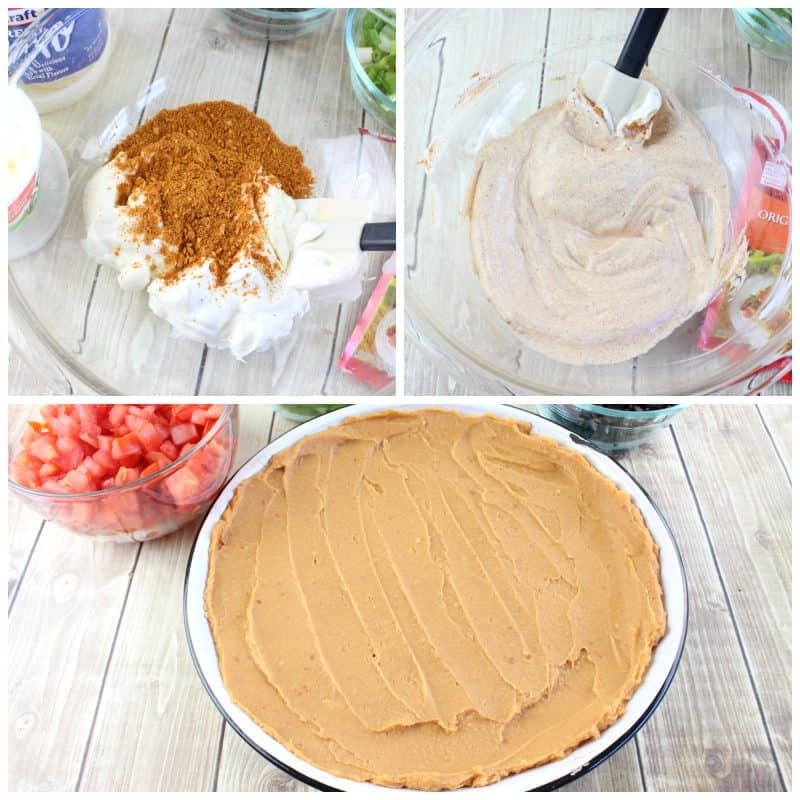 Also do half and half sour cream and softened cream cheese (instead of mayo) and add a layer of Pace chunky salsa over the sour cream/cream cheese layer. Sound so wonderful Sergio! I hope you have a blessed holiday weekend! Glory! With all of those ingredients, how could it possibly be bad!? I think I could eat that whole dish by myself. Love the stories about Grandmama’s. They are such special people. There isn’t a day that goes by that I don’t think of my Grandmother, who passed in 2008. She left a permanent imprint on my heart. I am 39 and still have one grandmother left. She was recently diagnosed with Alzheimer’s. It makes me sad. I love that generation of people who grew up on farms and didn’t start out their lives with indoor plumbing or running water. It was a hard life, but that seemed to make them stronger but also they had such gratitude for what they had in life and were such sweet people. Oh, one day I bought similar in the grocers. Loved it so home I went to try to copy. Yes cream cheese made it in mine and for beans just smashed some chili beans . Used winter onions chopping the green parts. Sure like your Grandmas version. It’s a winner. Thanks for sharing. Thank you Patsy, we thinks so too!!! My mom has made this for years for potlucks. No one will let her bring anything else anymore. She does hers in a 9×13 pan (double the recipe you have there) and it is devoured in minutes every single time. Thanks for sharing your memories that go with this dish, I to had to be coaxed into the first bite. Now it’s just hoping I get to get a scoop or so before it’s gone! 🙂 yep, all it takes is one bite!! Sunshine, in the post where the photos are of the sour cream mixing you forgot to add the written instructions..you know..where you “stirry, stirry” 😉 love you baby girl. I’m SO glad to read that there’s at least ONE other person out there who isn’t keen on avocados. Yuk! 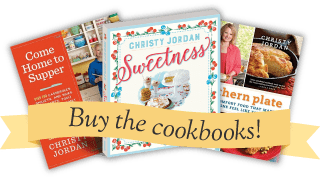 I can’t find a recipe that was great. Similiar to this, but it said they used Desert black bean dip. Did you have this?